There is more bad news for job seekers. A study by Naukri.com, states that the Overall Job Index in October 2008 is 781 as compared to 1000 in July 2008 indicating a decline of almost 21.9 per cent. Historically, there is a seasonal decline in October which is around 10 per cent as recruitment slows down due to the festive season. The index suggests that companies are scaling back their recruitment plans due to the global financial crisis. Banking and financial services have seen a decline of over 32 per cent in October, while construction and engineering have seen a decline in new jobs by almost 22 per cent since July 2008. The pharma industry has been comparatively less affected with a fall in the index of less than 15 per cent. Niche sectors like government and legal have seen an increase in new jobs. The metros saw a dip in the supply of new jobs. Besides the slowdown, Diwali and Dussehra impact hiring to a considerable extent. Metros that generate jobs saw a decline in new jobs to the tune of 16 per cent in comparison to the usual 10 per cent in earlier festive seasons. In the Delhi-NCR region, new jobs fell sharply after maintaining stability in August and September. The job index for Delhi fell from 1000 to 786. Mumbai witnessed a higher setback in the month of Oct as compared to September and August, the job index fell from 1000 to 715 in October 2008 as compared to July 2008. Bangalore, the IT hotspot, has lost new jobs since July, especially in August which saw a decline of close to 20 per cent as compared to September. Chennai saw a marginal increase in new job creation during September, however October saw a fall to the tune of 10 per cent. Hyderabad and Pune bore the brunt of the slowdown, especially in the IT sector, and witnessed a decline of over 15 per cent in new jobs during October. Jobs in Kolkata were severely affected with October alone witnessing a decline in new jobs by over 32 per cent. Chandigarh saw a slowdown in hiring to the tune of 35 per cent since July due to a slowdown in the IT sector. The banking industry shows a slowdown in hiring in the month of October. Legal and government jobs saw an increase over the period of August, September and October 2008. Over the past three months, real estate, banking, finance, IT and retailing show a decline; while telecom, pharma and hospitality emerge as attractive options. Some niche sectors, like government, defence and legal sectors have gained attractiveness in recent months. The Indian IT-BPO industry (including domestic market) recorded an overall growth of 28 per cent (currency adjusted), clocking revenues of $52 billion in FY07-08, up from $39.6 billion in FY06-07. According to an annual Nasscom survey on the performance of the Indian software and services sector (excluding hardware), the domestic segment grew by 26 per cent (in INR) to register revenues of $11.6 billion in FY07-08. 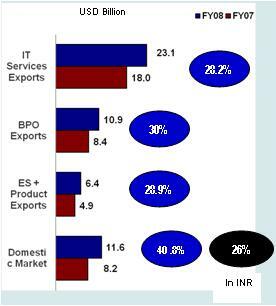 Within the export segment, IT services exports have grown by 28 per cent (in USD) to clock revenues of $23.1 billion; while BPO exports are up by 30 per cent (in USD) registering revenues of $10.9 billion. Engineering services and products exports clocked revenues of $6.4 billion, growing at 29 per cent (in USD) in FY 07 -08. The survey projected that the overall software and services revenues will grow by 21-24 per cent (currency adjusted) to touch $50 billion in FY08-09. Som Mittal, president, Nasscom, said: “The Indian IT-BPO industry’s resilience is reflected in its FY07-08 performance, with a 28.2% overall growth rate and next year’s projected growth between 21-24 percent. Given that we are well on our way to achieve the target of USD 60 billion in exports by FY09-10, the industry is now focusing on improving productivity, efficiency, as well as opening up new markets and services”.